Cars are amazing creations. We get to surround ourselves with technology designed to move us and protect us from the elements and other hazards. Unlike our ancestors who had to travel exposed, we can enjoy getting from one place to another with the added protection all while listening to our favorite music and controlling the temperature. However, being kept in such a confined space can be a bad thing when there is unwelcome car smells in the car. It can come from all sorts of things, from a milk spill, to food, to cigarette ash, to some hidden offender you haven’t quite found but certainly know is there. It can make even a drive down the street unbearable and if you have a passenger it can be embarrassing. 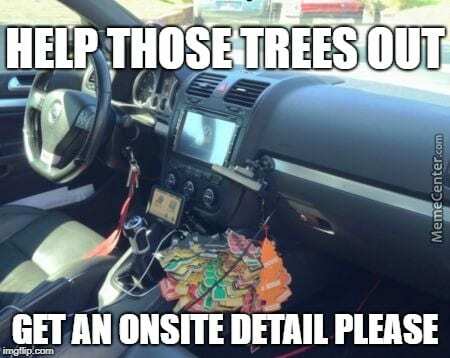 Unfortunately we have had people tell us that others don’t even notice how bad their vehicle smells at times. Here at Onsite Detail our Interior Detail service has saved many a driver, and passenger, from having to face such an unwanted situation. Our Interior Detail cleans and sanitizes every surface inside the vehicle, from steam cleaning the cracks and crevasses to shampooing carpet and upholstery. However, it isn’t just us saying our Interior Detail service is great. Many of our clients have reviewed our services and have reported back satisfaction for helping with car smells. This blog will look over what people have had to say as well as review our process for helping with bad car smells. Our Interior Detail is often a recommended first step to rid vehicles of unwanted interior odors. Car smells that linger come in two forms- something you can throw away easily, and something you have to deep clean or extract. When the detailers first clean the inside of the car, they clear out any debris and vacuum the car. Our detailers have shared with me that sometimes the bad smell in a car is as simple as food that rolled under the seat and molded, or a piece of trash that got to sit in the car long enough to stink. These are usually as simple as tossing them in the garbage and making sure there is nothing “odor causing” remaining. Unfortunately not all bad odors are this easy to remedy. Some of them get into the carpet, fabric or the leather and won’t come out no matter how nicely you ask them too. I’ve had clients call in saying they tried to treat it themselves with steam cleaners or soap and water and it still comes back to haunt them. Some have used so many air fresheners and sprays to try to get rid of it but in reality it’s just a temporary cover up. A lot of smells are so embedded in the car that the client can’t get it on their own, like cigarette smoke or a pet mess. How do those get worked on? 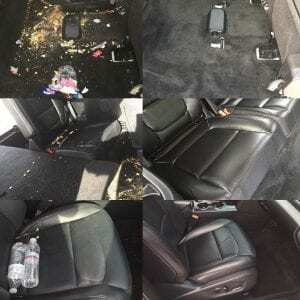 When our detailers come and clean the inside of the car it helps to determine the different possible places where the smell might come from or what’s causing it the nasty odor. Our detailers will vacuum, steam, shampoo, and scrub any cloth surface of a car and extract mats to get to deeper layers. For smells like cigarette smoke their steam cleaning can get it out of vents and crevices that might be holding onto it, as well as clean surface layers where the smell might linger. Surfaces like cup holders, windows, and headliners are also cleaned entirely. If a smell has a risk of sticking around even after our service, we provide Odor Bombs for $25 each, which can be released in the car overnight and help eliminate anything that stays by killing and destroying any odor causing baterias. While we cannot guarantee the smell will be eliminated, over 90% of the time we are successful in cleaning out the smells after an Interior Detail and almost 100% with Odor Bombs in the worst cases. That’s not a claim we are making up either. Here is a sample of reviews that address bad smells directly to back us up! Richard was a customer who needed lots of help with his new car. Here is what he told us when our detailers finished the job! Among our most common bad smells are dairy-related ones. Two reviewers, both named Dan, shared with us how we helped them with their situations. In summary, keeping your car smelling clean and fresh is an important part of keeping you and your family and friends happier and healthier. Our service has helped many people achieve cleaning and eliminating even the worst smells, and we are ready to tackle yours too! Get the nasty odors and smells taken care of before the weather heats up and makes them worse! Call or text us or fill out a request form today. We look forward to serving you and your vehicle! Without proper clean up, you can create a breeding ground for virtually every germ known to man. In cases like this, you need to choose a straight-forward odor removal system. But first you have eliminate the cause. Can you remove coffee smell?